aron has spent the first decade of his career practicing in New York City, where he litigated sophisticated business matters against the top firms in the nation. 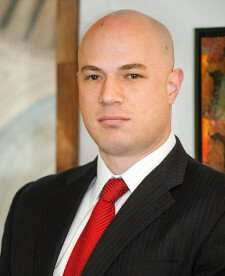 Aaron has litigated cases involving matters ranging from banking to securities to contract disputes to legal malpractice. Aaron has also litigated cases arising out of some of the largest bankruptcies in American history. Aaron is a British Columbia native who attended the University of Victoria. He graduated with distinction with a Bachelor of Arts in History, and was on the Dean’s List every year. Aaron then attended Cornell Law School. Aaron is admitted to the Colorado State Bar (2014), and the New York State Bar (2004). He is also admitted to practice in the Federal District Court of Colorado, the Southern District of New York, the Western District of New York, and the United States Court of Appeals for the Second Circuit. Aaron is an avid hiker, rock climber and martial artist. ©1998-2018 The Hustead Law Firm. All rights reserved.